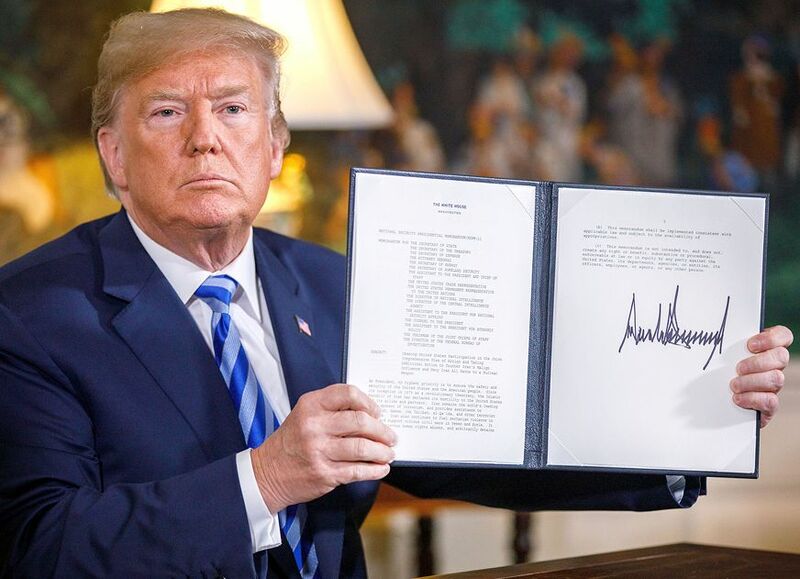 President Trump announced this week that he was pulling the U.S. out of the Iran nuclear deal, a long-expected but deeply controversial move that dismantles his predecessor’s signature foreign policy achievement and may isolate Washington from its Western allies. Denouncing the Joint Comprehensive Plan of Action as “horrible” and “one-sided,” Trump said the U.S. would reimpose oil sanctions that were lifted from Tehran as part of the accord and introduce additional economic penalties on the regime. Under the 2015 deal, which was also signed by the U.K., France, Germany, Russia, and China, Iran agreed to stringent restrictions on its nuclear program and international inspections in exchange for sanctions relief. Trump said the agreement was “defective” because it didn’t stop Tehran from testing ballistic missiles and supporting terrorists, and because some of the agreement’s restrictions will expire in 2025. Saying he wanted to negotiate a “new and lasting deal,” the president warned the Iranians that if they restarted their nuclear program there would be “very severe” consequences. Iranian President Hassan Rouhani said his government would continue to abide by the deal with the other nations for the time being, but warned that the regime would resume uranium enrichment if the accord no longer provided enough economic benefits. The leaders of Germany, France, and the U.K.—who all heavily lobbied Trump not to withdraw from the deal—said they were still committed to the agreement. Former President Barack Obama sharply criticized Trump’s decision, saying it risked “another war in the Middle East.” But Israeli Prime Minister Benjamin Netanyahu praised the president for his “courageous leadership.” Gas prices, already climbing in anticipation of Trump’s announcement, were expected to rise further as a result of sanctions on Iranian oil. The president “just brought us closer to war,” said The Washington Post. The deal “was far from perfect,” but it was working: International Atomic Energy Agency inspectors have confirmed that Iran was complying with the restrictions, thus preventing it from developing nuclear weapons. By unilaterally pulling out, Trump is giving Tehran’s hard-liners the excuse they need to “resume uranium enrichment, restrict inspections, [and] perhaps even race for a bomb.” If nuclear activities resume, what can the U.S. do other than take military action? Obama, and not the U.S., made this “lousy” deal with Iran, said Bret Stephens in The New York Times. He “refused to submit the deal to Congress as a treaty” because he knew it wouldn’t pass. Trump’s “courageous decision” gives the mullahs a simple choice: They can have a “functioning economy, free of sanctions and open to investment,” or they can continue supporting terrorists and resume their nuclear program. “Trump’s reimposition of sanctions is coming at an ideal time,” said Philip Klein in the Washington Examiner. With high unemployment, inflation, and a currency crisis, Iran has been racked in recent months by protests and labor unrest. The regime may well be “losing its grip” on power—and reintroducing sanctions could accelerate its collapse. On the cover: Rudy Giuliani.